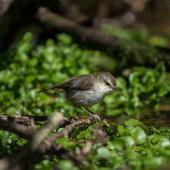 The Chatham Island warbler is a small forest bird that is endemic to the Chatham Islands. 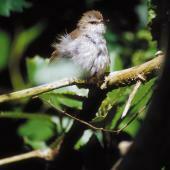 It is rare or absent over most of the main island, but is still present in the southern forests, and there are several healthy populations on islands in the south of the group. 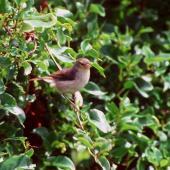 It differs from the grey warbler of the mainland in being larger, and having distinct male, female and juvenile plumages. More often heard than seen, its loud warbling call is reminiscent of a grey warbler that hasn’t been fully wound-up, with the initial song phrase repeated over and again. Chatham Island warblers glean invertebrates from leaves and crevices in trunks and branches and sometimes on the ground; unlike the grey warbler, they rarely hover. 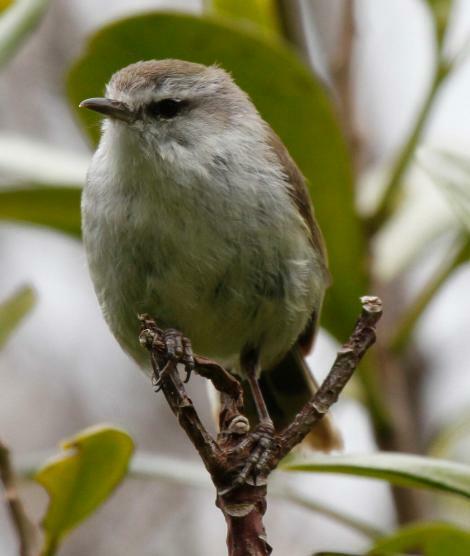 The Chatham Island warbler is a small pale forest bird with plain olive-brown head and upperparts, and off-white underparts except for pale yellowish flanks and undertail. The larger male has a prominent white forehead, eyebrows, throat and underparts. 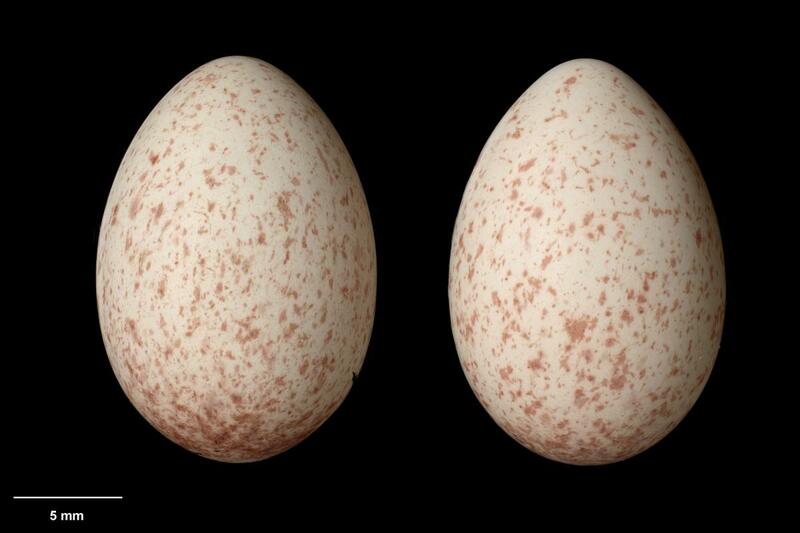 The smaller female lacks the white forehead and has dull greyish-white underparts and yellowish eyebrow, cheeks and throat. 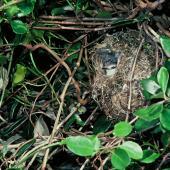 Juveniles are similar to females, except that their upperparts are olive grey and their underparts are yellower. 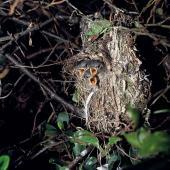 Adults have red eyes, juveniles have brown eyes. Voice: male song is a loud trill of 4 notes chi-ch-ch-ch repeated several times over. Similar species: juveniles have similar colouration to silvereyes, but lack the white eye-ring and pink-buff flanks of the silvereye. 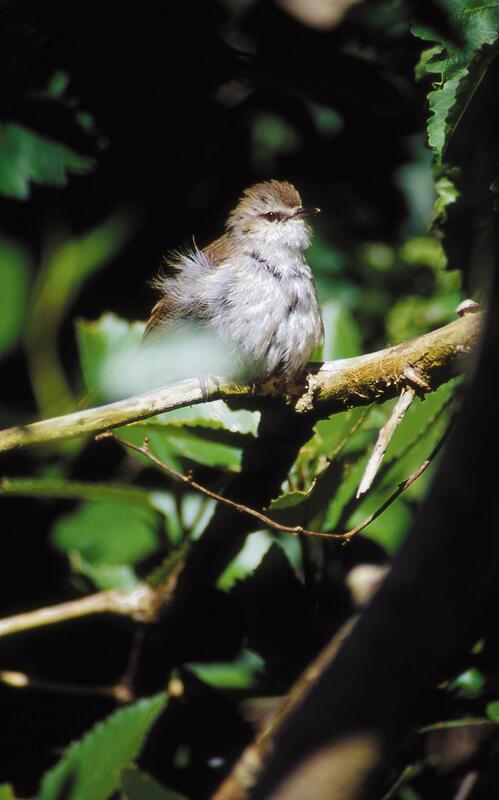 Chatham Island warblers are widespread and locally common in forest in the southern half of Chatham Island, especially in the south-west. They are common on Pitt Island, Little Mangere Island and Star Keys; abundant on Rangatira and Mangere; and recorded from The Castle. 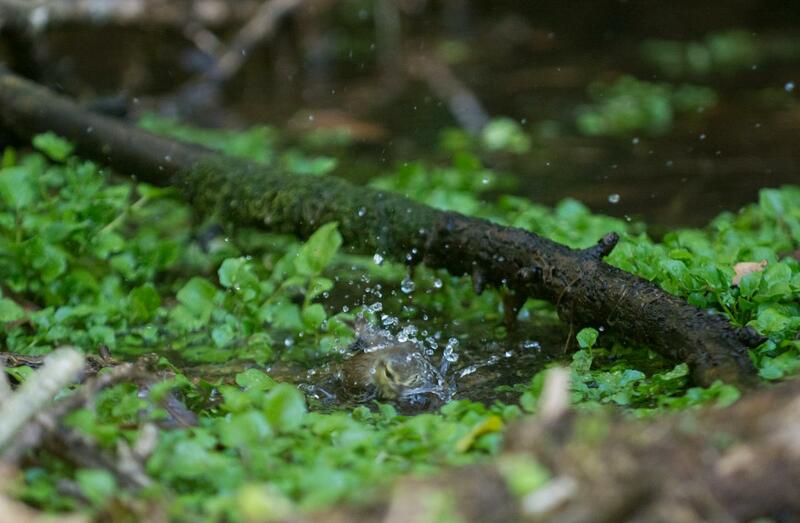 Historical records show that they used to be in the northern half of Chatham Island into the early 1900s, but have possibly declined because of habitat loss, degradation of the understorey in remaining forests, and predation by cats and rats. 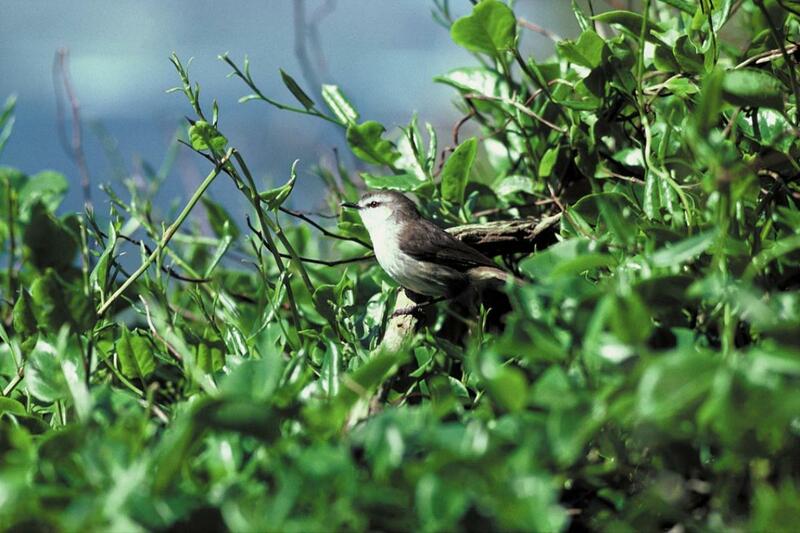 There are probably around 5000 adult Chatham Island warblers. 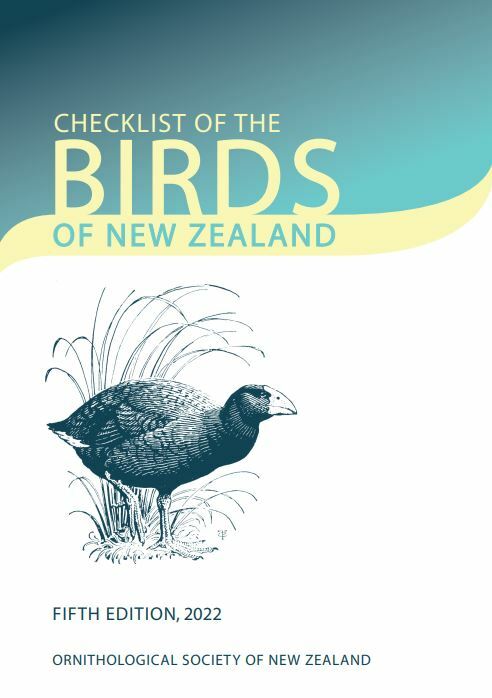 They can reach very high densities in suitable predator-free habitat: 10.4 pairs/ha in Woolshed Bush on Rangatira, compared with 0.3 pairs/ha in the Tuku Valley in south-west Chatham Island. 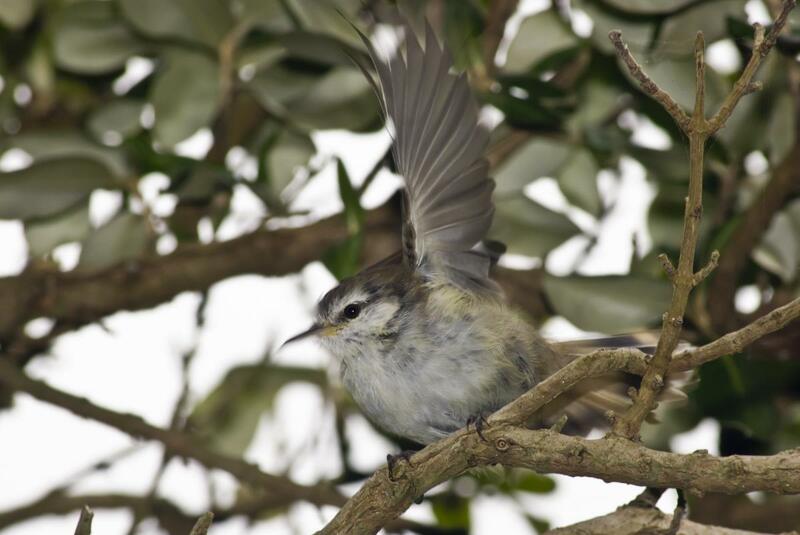 Chatham Island warblers died out in the northern part of Chatham Island in the early 1900s, but seem to be holding their own in the southern half of Chatham Island. They will have benefitted from the creation of sanctuaries free of grazing and browsing mammals, and where pests are controlled. 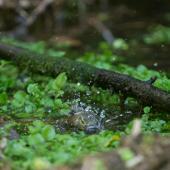 They are secure on several predator-free islands south of Pitt Strait. 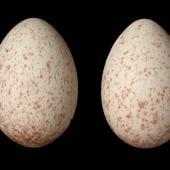 Eggs are laid from September to December. 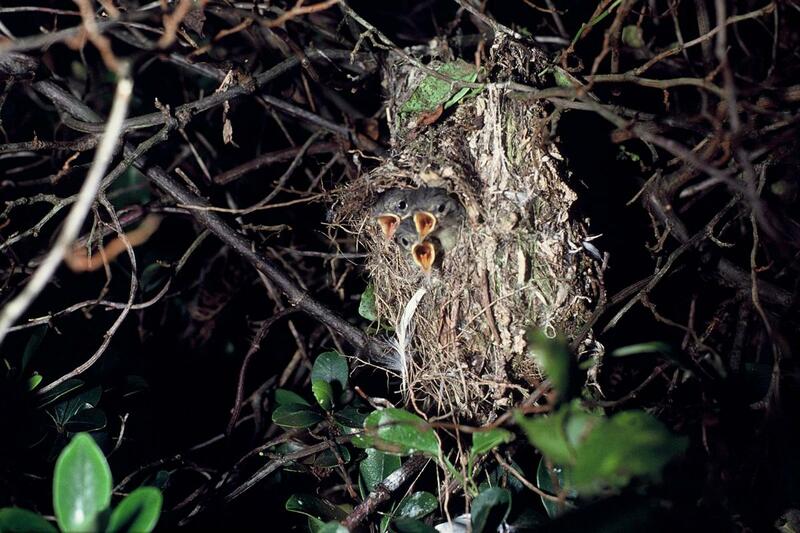 The female collects nest material and constructs the nest. 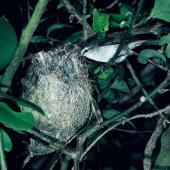 It is an enclosed pendant nest, similar to that of the grey warbler. 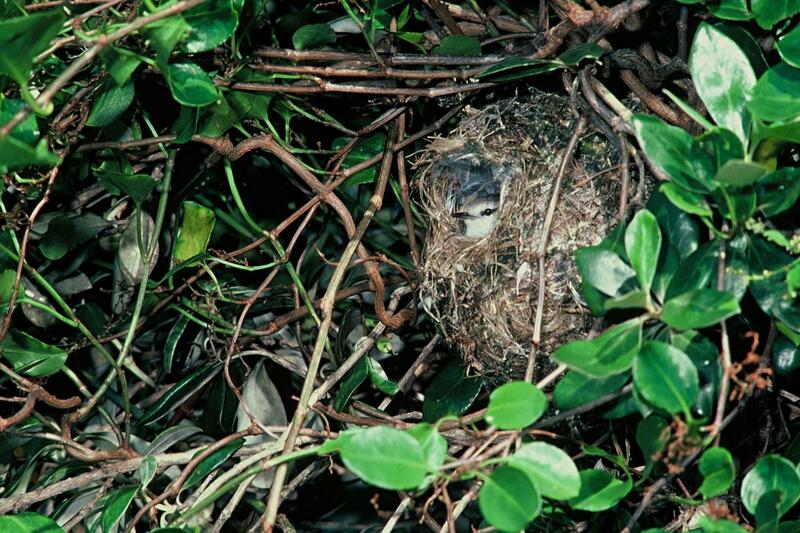 On main Chatham Island nests are generally in the open on a terminal branch of Dracophyllum, but on ‘petrel-islands’ they are situated in dense foliage with lateral and basal connections, presumably to protect them from petrels landing at night. 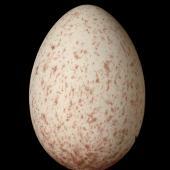 Clutch size is 2-4 white eggs with reddish flecking concentrated at the larger end. 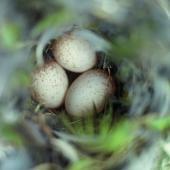 Incubation and brooding is by the female only, but both parents feed the young, and usually split the brood after they have fledged. 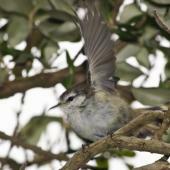 Chatham Island warblers are not particularly strong fliers, but they do fly purposefully through the canopy or shrub layer when having territorial disputes. 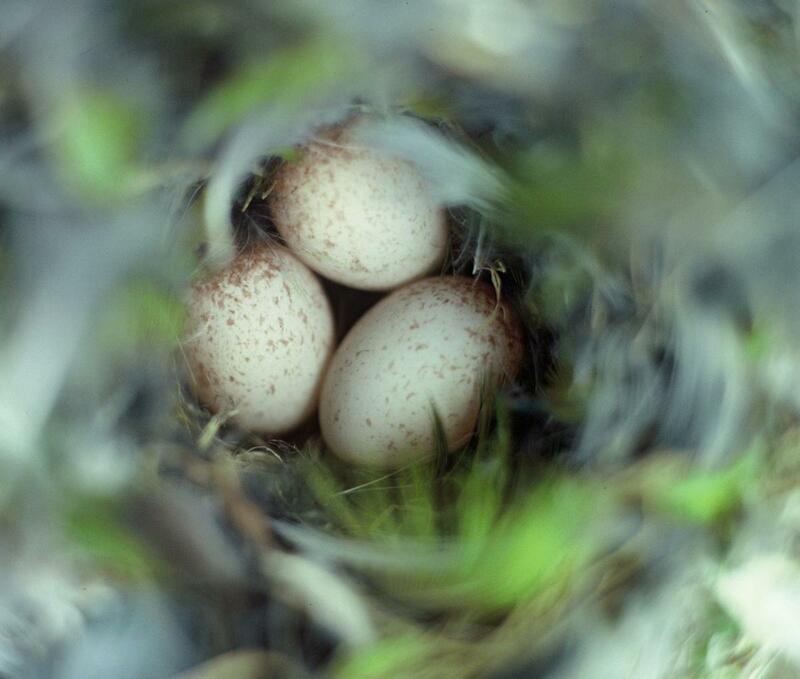 Some late nests are parasitised by shining cuckoos. 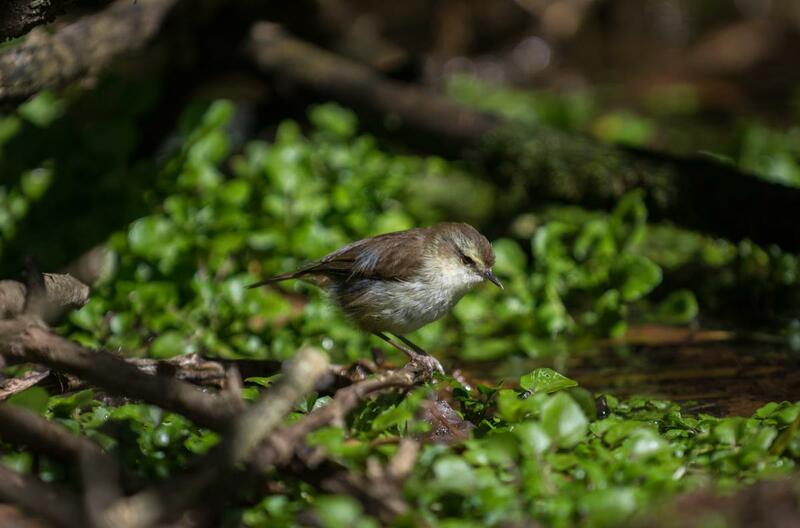 They feed mainly by gleaning insects from leaves and from crevices in trunks and branches rather than hovering as the grey warbler does. 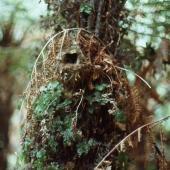 They forage at any level from the leaf litter to the canopy at predator-free sites, but mainly in the canopy on Chatham Island. 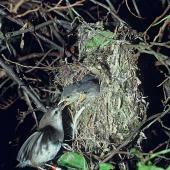 Chatham Island warblers eat mostly small invertebrates, especially spiders, caterpillars, flies, beetles and bugs. Dennison, M.D. ; Robertson, H.A. ; Crouchley, D. 1984. 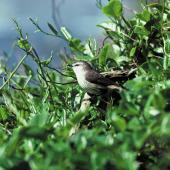 Breeding of the Chatham Island warbler (Gerygone albofrontata). Notornis 31: 97-105. Robertson, H.A. ; Dennison, M.D. 1984. 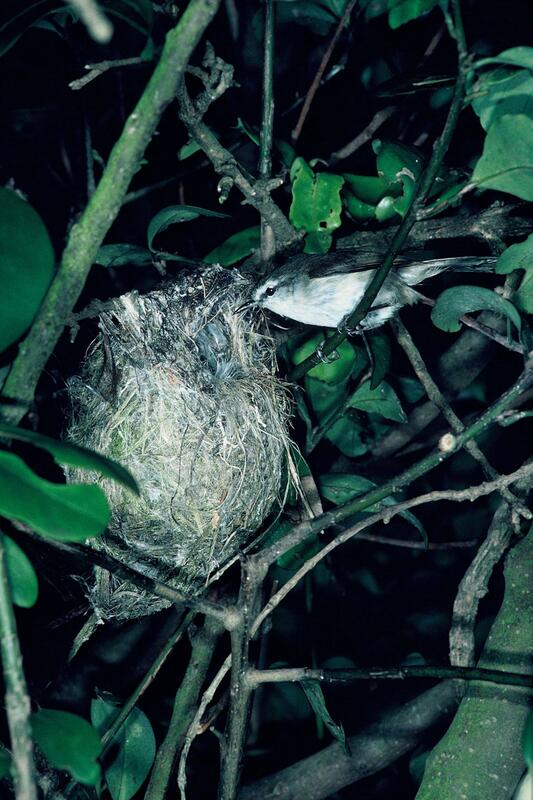 Sexual dimorphism of the Chatham Island warbler (Gerygone albofrontata). Emu 84: 103-107. 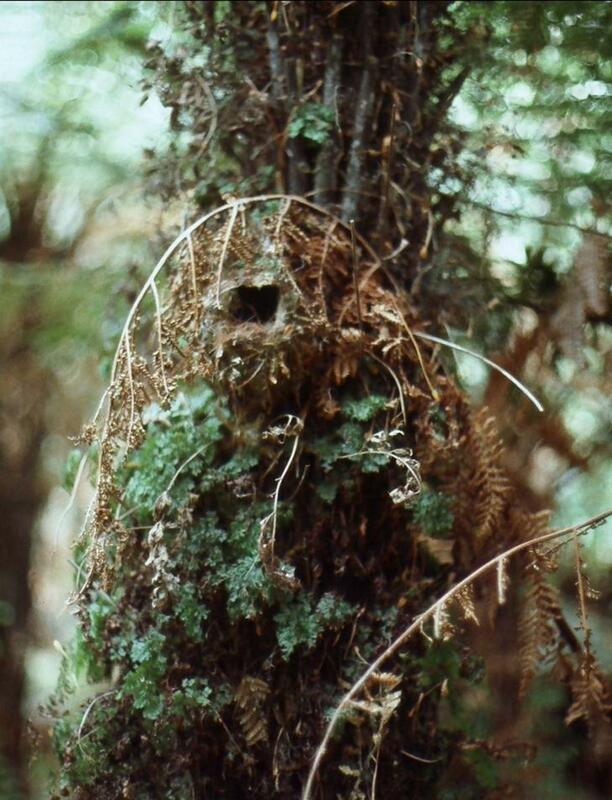 Enclosed pendant nest with a side entrance near the top; hanging in the open or placed in dense vegetation with lateral and basal connections. 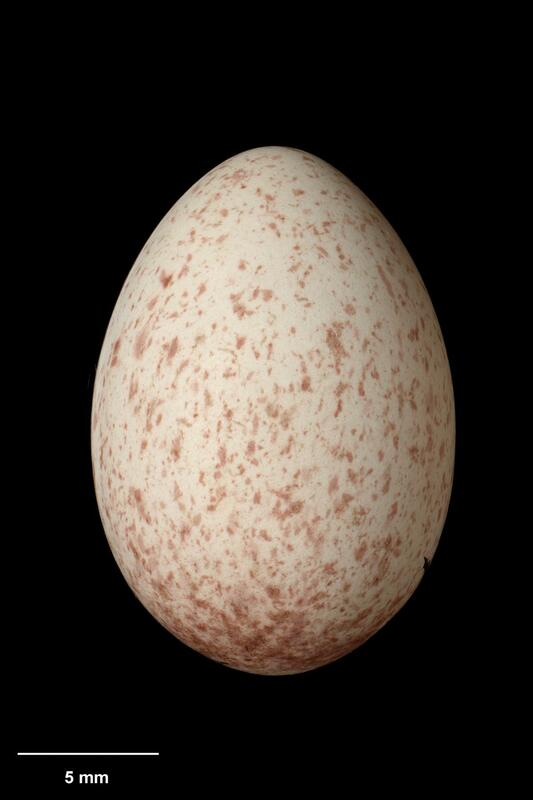 White with reddish-brown speckles concentrated towards the larger end. 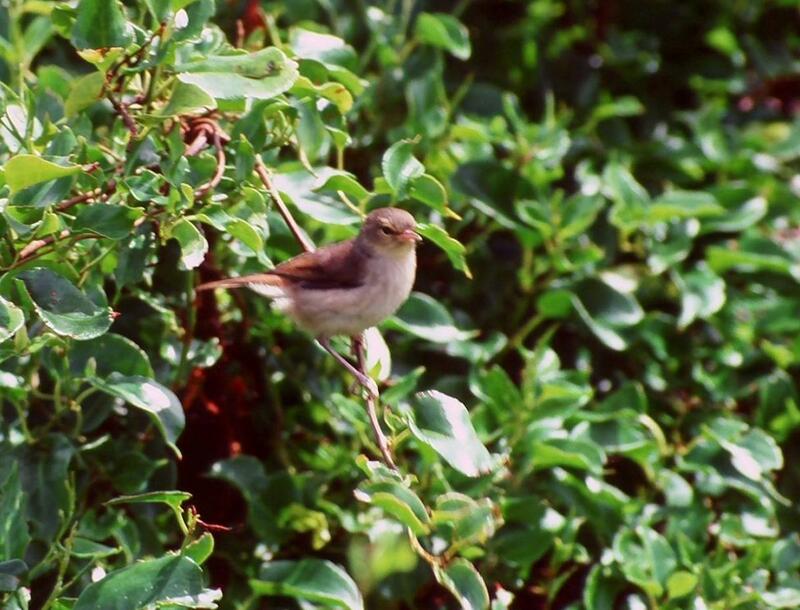 A small pale songbird with olive-brown head and upperparts, off-white underparts, pale yellowish flanks and undertail, white forehead, eyebrows, throat and underparts, and red eyes. The smaller female lacks the white forehead and has dull greyish-white underparts and yellowish eyebrow, cheeks and throat; juveniles are similar with olive grey upperparts, yellower underparts and brown eyes.